Growing Herbs In Containers will provide you with lots of yummy herbs! 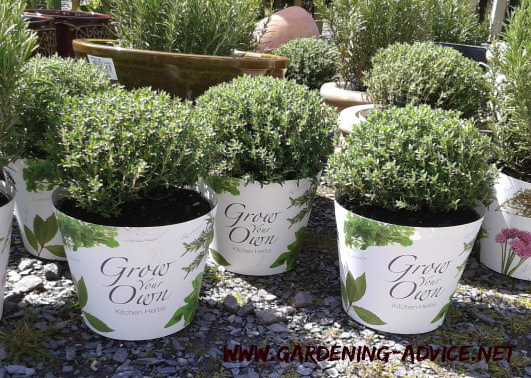 These gardening tips for growing herbs in pots will help you to avoid frustrating mistakes! Growing herbs in containers of course takes a little bit of effort but you are rewarded with delicious tasty and healthy greens. Herbs though need less care than a lot of flowers or vegetables. Regular watering and feeding are the most important tasks for herbs in pots. An advantage of growing herbs in pots is that they hardly need any weeding. This is a very time consuming and labour intensive task if you grow herbs in the garden. Herbs that you keep from year to year might need re-potting every now and again when they outgrow their pots. If you are growing herbs in containers they need to be watered regularly. Thinking that they like dry conditions does not release you from doing this regularly. How do you know that your herbs need water? If the plants are drooping it is a bit late to water. They might still recover if the potting soil is soaked well but this is unnecessary stress for your plants. The best thing is to press your fingers on the soil and feel for moisture. If it feels dry you have to water! Watering from the top: this is probably the most popular method but it might not always be the best way. Some herbs e.g. 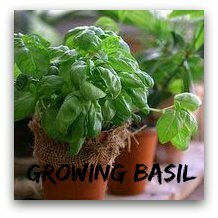 Basil might start rotting with this watering method. The soft stems particularly of young plants tend to be susceptible to fungi and bacteria if they are constantly moist. If the soil has dried out completely the water will only run over the surface of the soil and run out at the bottom of the pot. You need to soak the pot in a bucket or saucer for several hours to make it soak up the water again. Watering from the bottom: For growing herbs in containers place a saucer underneath the pot and fill it with water. Let the plant soak up what it needs and discard any water that is not soaked up within 15 minutes. 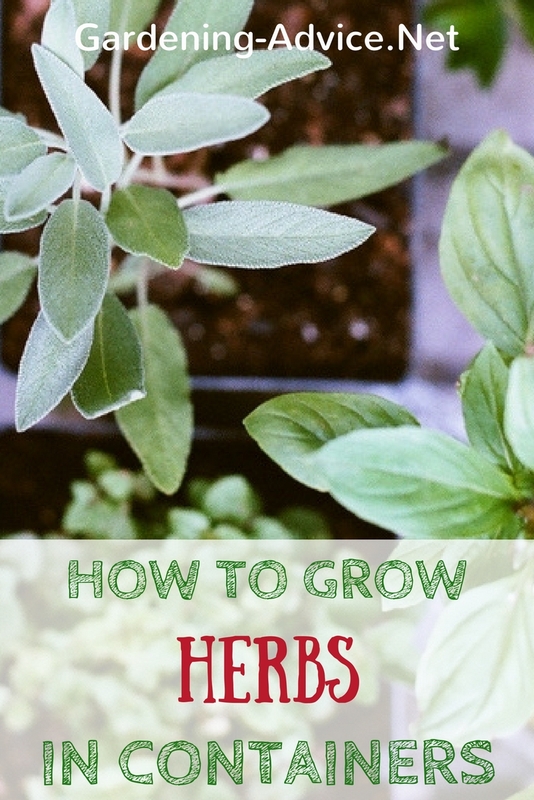 This method works very well if you grow your herbs indoors. If you use this method outside you have to remember to remove the saucers if you have longer periods of rain. 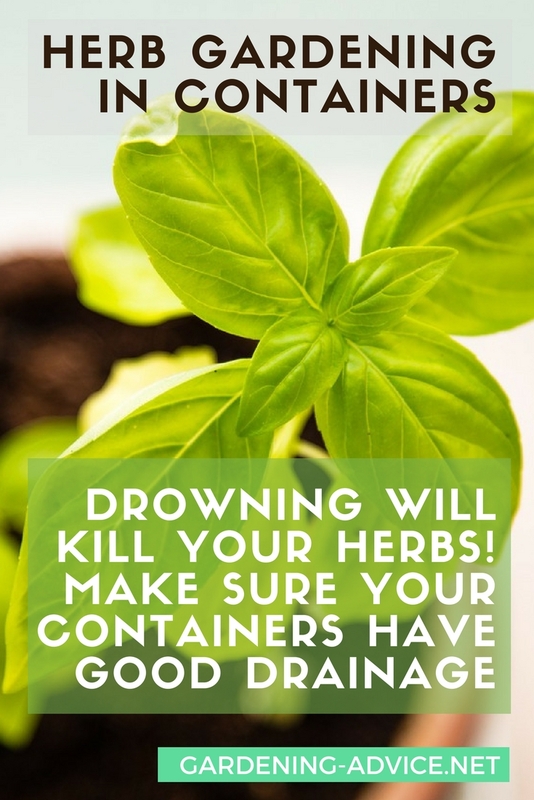 Standing in water for longer periods of time is lethal for herbs (and most other plants!). Drowning is the most common cause of death in potted plants. This can happen easily if you keep your plants in pots with no drainage holes in the bottom or simply water too much. The tricky thing about this is that the plants are showing symptoms of being too dry - the leaves are starting to droop...and most people think the plant is too dry and water even more! The reason for the drooping is that the roots are rotting and can't absorb the water any more. The best time for watering is either in the morning or in the evening. You can skip of course if the weather is cool or wet. Use your green fingers to determine if your herbs need water. Don't make the mistake to forget herbs that you overwinter outside in pots. They need some watering during dry frost free periods. Losing them during the winter is more often down to no watering and drying out than to the frost. Also think of checking plants that you keep in the shelter of walls or under balconies. They might not get any water from the rain and need to be checked more often particularly if they are evergreen. 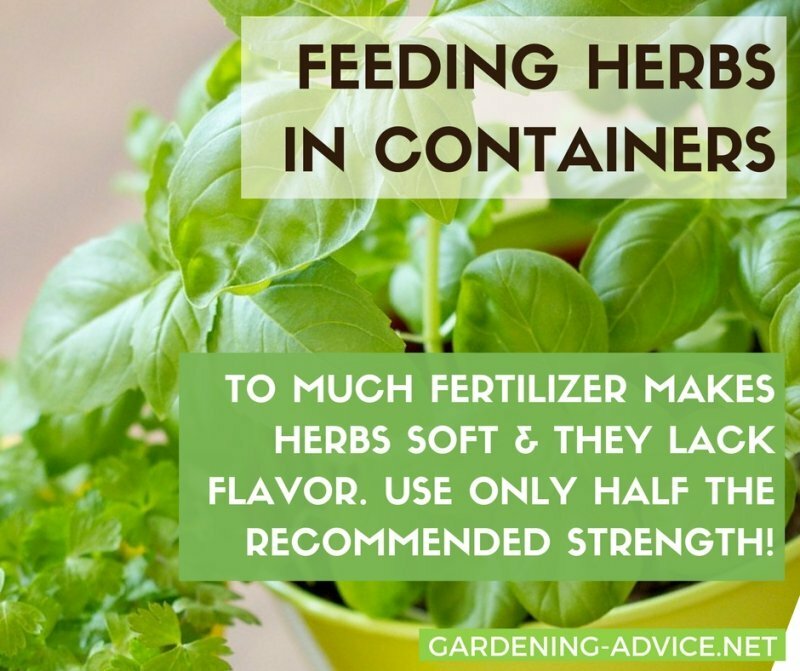 Although herbs need less feeding than flowers and other container plants you can't completely forget about it. 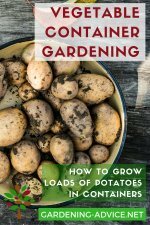 If you are growing herbs in containers you have to supply some nutrients for your plants to do well and keep producing fresh foliage for you to enjoy. 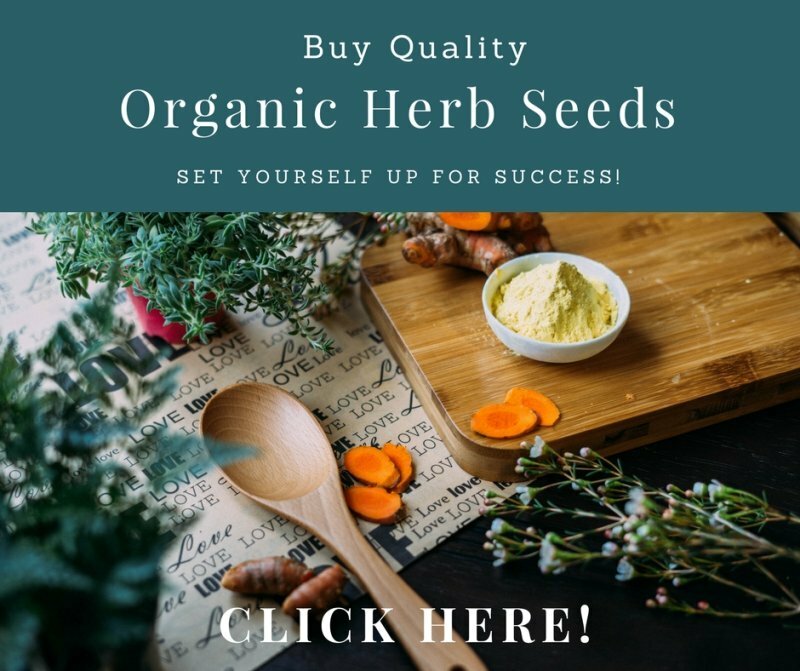 Organic fertilizers are the best for herbs. 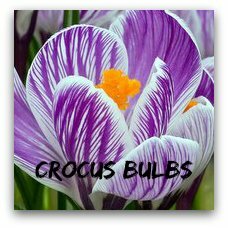 They contain less nitrogen than chemical fertilizers and also have a slow release action because they need to be transformed into plant-absorbable nutrients by the soil bacteria. That means that the nutrients are released over a period of time rather than in one go. An advantage of this is that you don't do damage to the roots as easily in the event you use too much by accident. Too Much Or Too Little Fertilizer? Overfed herbs tend to grow a lot of soft foliage with little flavour. The key is to find the balance between too much and too little. My general recommendation would be to reduce the fertilizer amount to half the recommended dose on the pack. Yellowing or small leaves and stunted growth is a sign of not enough nutrients...time to start a regular feeding program. Plants that have just been potted up with fresh organic potting soil don't need to be fed for a while. Feeding is also only needed during the growing season from April to August or September depending on your local climate. 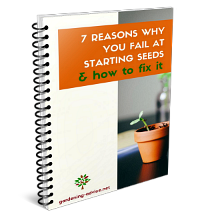 Annual short lived herbs like chervil or cress don't require any feeding. Perennial herbs that you keep from year to year need to go into a larger size container when they run out of root space. The best time to do this is the spring but you can also do it later on in the summer if necessary. Choose a pot that is a couple of inches larger than the original container. Fill the bottom of the pot with your potting soil mixture. Remove the pot from the root-ball and place it into the centre of the new container. Make sure that the height of the top of the root-ball is correct. It shouldn't be higher or lower than before when you are finished with the job. 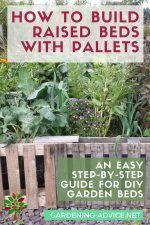 Fill in the soil around the root-ball and make sure to leave no pockets. Firm the soil gently with your hands. Water the plant in well until the water runs out at the bottom of the pot. 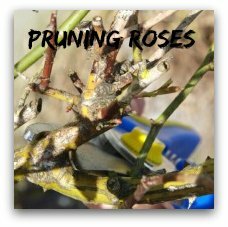 This is best done with a fine rose or sprayer so you don't wash out the soil over the edge of the pot. This is an important last step because it firms and settles the new soil onto the roots. After this watering procedure your might not need to water your herb for a few days. You can also skip on feeding for the next six weeks. To keep your plants bushy they might benefit from the occasional trim. If of course you use them a lot there might not be anything to trim off. Thyme, Sage, Rosemary and Bay Leaf are best pruned in the early autumn. This will prevent the plants from going bare at the base. Cut back long shoots to encourage the plant to bush out more next spring. Cut Thyme and Sage back to about a third. 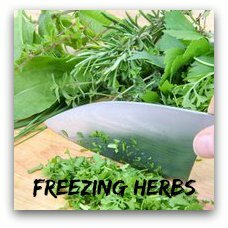 Herbs that die back for the winter can be cut back to ground level. Candidates for this are Oregano and Marjoram, Lemon Balm, Lovage, Mint and Tarragon. 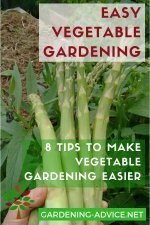 Don't waste what you trim off your plants! You can preserve them by freezing herbs or drying them.